Want to join the ODP? It’s easy! Just drop an email to project lead Andy Farke (andrew.farke@gmail.com) and we’ll sign you up! Then get the files and start entering data! That’s all it takes. Seriously. We do recommend you read the FAQs and other relevant portions of this site, so you know what exactly you’re getting into. Once you have entered data, your name will appear on the contributors list (and you will be eligible for authorship on the resulting paper!). Congratulations – you’re now an official member of the ODP. Hello, I’m a research librarian at Purdue University whose work centers on the social/cultural aspects of data curation. I happened to stumble across the Open Dinosaur project the other day and I’m very interested in both the project and the process you are using to accomplish your goals. I’d like to support your work in whatever way that I can, so please sign me up to be a contributor. Thanks! Hello, I’ve been interested in paeleontology for a significant portion of my life, and am very pleased to hear of this project. I am currently only a teen, and so must bide my time in the ametuer field for now. I specialize in the group Phorusrhacidae (colloquially known as terror birds) and would apppreciate a saurisichian branch. However, I also have a great love for and devotion to studying the ceratopsian, iguanodont and notosaur groups. Hi, I’m a student in Southwestern Ontario and I’ve been interested in Dinosaurs most of my life. 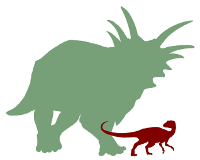 I also must bide my time in the amateur field at the moment, but I specialize in Pachycephalosaurs and Heterodontosaurs, and I hope I can contribute something useful to this project. Thanks! You guys know me. Basically part of my job is making data concerning Utah’s fossil record available. You can count on me, Don, Scott, and Martha supporting this effort. Hi, Jim, welcome aboard! This is fantastic news! you’re doing a great job, out there in ODP! I’m afraid I will stay in my little corner out of ODP, cause I’m just an amateur, dinosaur (and other exctinct animals)-lover, regular paper-reader, but no specialist at all! Glad to see such a project running! “Just an amateur” is certainly able to contribute to this project — that’s the whole point of it. And do we not all start off as amateurs?